This article examines the variety of the locally made ceramic group known as Pannonian slipped ware (Pannonische Glanztonware - PGW). For the Roman provincial archaeology of Pannonia this group has particular meaning because it is perceived as a regional amalgam of Roman imperial taste and local Celtic traditions. This phenomenon is even more intriguing given that almost all the imitations were burnished grey and black, differing significantly from terra sigillata originals. The quality of the imitations clearly indicates that such colouring was not a consequence of a technological deficiency, but a clear expression of local taste and demand. Imitations that were made subsequently, later in the second century, show that the preference for black/grey slipped imitations of terra sigillata persisted in this region, obviously representing a distinctive alternative to the ever-present red gloss terra sigillata that was later imported from Gaul and Germania. A re-examination of other sites in the region and contextualisation of published material shows that this was not an isolated phenomenon, but that these imitations were part of a regional ceramic group known as Pannonian slipped ware (PSW). 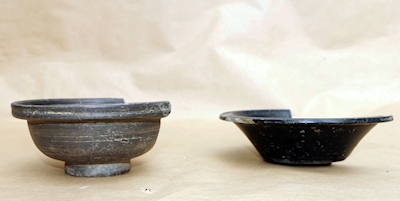 Several aspects of these imitations could be explored, but the task of this article is to investigate why these vessels were made as they were by comparing the PSW finds with original terra sigillata found in the region to determine patterns of differences and similarities.